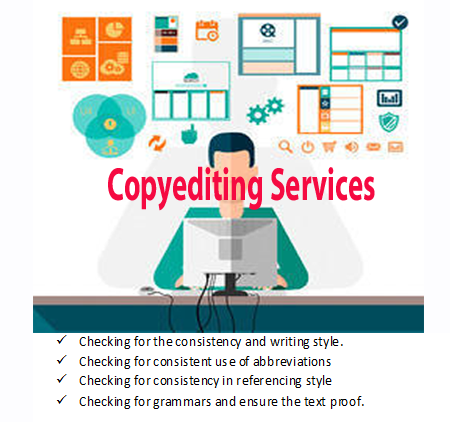 Allwell Solution copy editors have immense experience in copyediting and content proofing with keen eye process. We are specialize in data editing, editing rewriting, editing websites content, paper editing and editing written documents. Our copyeditors perform spell checks, grammatical checks and punctuation and syntax errors giving your manuscripts a professional feel. Copy editing efficiency in Allwell Solutions is facilitated by automatic checks that are performed by our system. This automation ensures consistency in presentation and accurate cross-referencing in the text. Spelling, grammar, punctuation, consistency and other style checks are also carried out on all papers. Fine blend of skills, experience, art and science to ensure spelling, style, punctuation, and structure. Copyeditors from art, humanities, science, math, engineering, commerce, accounts, and management background. Proficient in hard copy and online edits. Adept to Chicago Manual of Style, APA, AMA and other standard styles. Automation of coding and pre-edit stages of copyediting. This involves close analysis of your manuscripts at the paragraph, chapter and book levels. Our editors develop concepts effectively after evaluating every possible file. They organize the material to render appropriateness. They also check the relevance of illustrations, tables and lists in the work. The general accuracy and consistency of sentences in your manuscripts are check closely by our content editors to make them error free. Allwell Solutions language editing services provides a new look to your manuscript, fine-tuning the content to make your manuscript compliant with other international submissions with the help of our proficient specialist editors from varied disciplines. The in-depth knowledge and the varied experience of our Editorial team ensure the quality in delivery. The structural editing process precedes the copy editing process and it ensures that the manuscript is organized in a logical way which engages the reader. Content and Organization It lays the foundation of the content and ensures that relevant fields are covered.